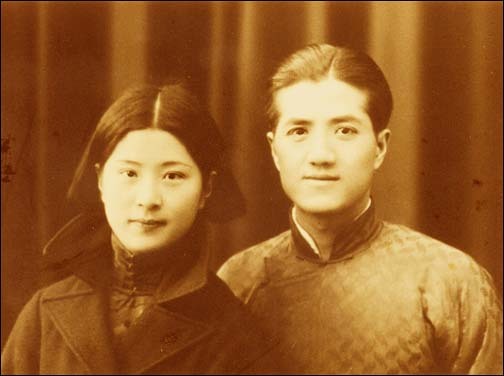 Dad and Mom were married in Wuchang, China on the first full moon of the Chinese New Year on January 15, 1934 (lunar calendar) or March 1, 1934 (solar calendar). They celebrated their 60th wedding anniversary in Palo Alto in 1994. After Mom broke her hip, they moved to Homestead Care Home in Sunnyvale in late 1997. When Dad developed swallowing problems, he needed gastrointestinal feeding 20 hours a day at Westgate Rehab Center in San Jose since January 2000. Dad hoped that his condition would improve so he could be together with Mom again. He would tell us "We've been married 66 years, why are you separating us like this." When Mom visited Dad on his 98th birthday (July 29, 2000), Dad was tired in bed and didn't speak at all. Mom phoned me and cried, saying that Dad didn't recognize her anymore. When I visited Dad the next day, I mentioned Mom's concern and asked him to write her name and birthday to test his memory. Dad wrote down Mom's Chinese & English name, her birthday, October 6, 1908, saying "I'm 98, Mom is 92." He then wrote down his three children's names and our correct birthdates, mentally subtracting our birth year from 2000 to determine our age. I congratulated Dad on his excellent memory at 98 years of age. You are dearest to my heart. I can't tell you all the love I have for you. You are my treasure, my shining star. My love for you is true love. but my home is in your heart.